Just returned home from printing at The Button Factory and working on my new montype project which taps my dreamlife and brings together text and visual images. I’ve been writing down my dreams for more than 30 years and call these writings Dream Notes. 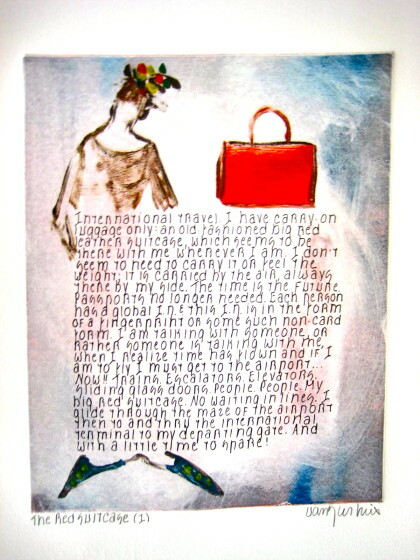 The Red Suitecase (I), shown here and printed in June, is my first finished Dream Notes monotype. One dream. One monotype. Last month I began working on The Very Large Bird series of monotypes. This was a long and visually rich dream, so will require lots of paper and time to complete. I’ll let you know how this project unfolds.